Next Article A FINE howdy-do. Aaron, glad to see a fellow friend who appreciates a good LOR reference. Let's do Radcon sometime. (Your comment actually made me laugh out loud! )Allison–I'm not making any promises, but this remote has definitely improved our marriage.Nancy–When he loses this one, I'll be camping out at your house w/my children, because I'm sure the restraining order will keep him out of there. What happens when he loses this one? If I get Ken one of these, will he stop asking for a motorcycle? So who bought it? Did Derrick go out and buy it after the other remotes were lost or did you buy it to end all the drama!!! Come on, I am sure there is a great story behind this! Finally!!! It has taken forever for him to get one! I hope it is the answer to all of his questions and fulfills his every wish! I hope the kids (Derrick) doesn’t miss place it! Ha ha ha … that made me laugh Julie. Jen- first of all, thanks so much for your sweet comments- you really are too kind! 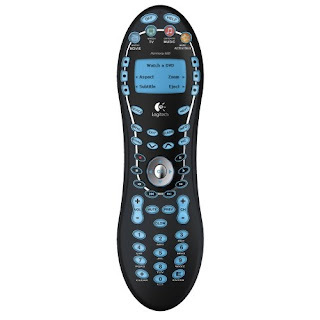 And secondly, that has to be the most intense remote I’ve ever seen… definitely NOT for amatures!